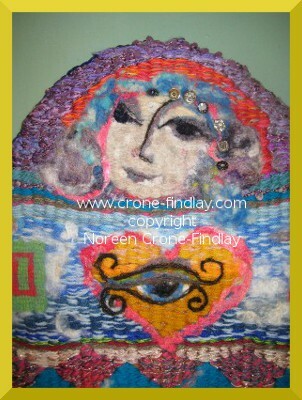 For many months, I have been working really hard on new mixed media fiber art sculptures. The 6th Sense is intuition/inspiration/imagination. These one of a kind art dolls are based on dreams, memories, meditations and contemplations and are an invitation to embrace creativity, healing and wholeness. They are a combination of tapestry weaving, narrow band weaving, lucet cords, tatting, knitting, wood work wire work and leather work. 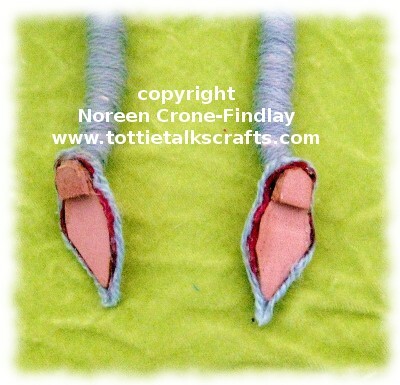 Here’s a slide show video of my 6th Sense One of a Kind Art dolls. Most of the 6th Sense One of a Kind Art Dolls in the video are for sale, but some of them have already sold and gone to live in their new homes. As part of my ongoing participation in a year long weave along of tapestry diaries, I am weaving small images for my Woven Women show of tapestries and other woven works. I have just finished 2 new tiny woven pieces – they were both on the same loom, so I had to finish the second one so I could cut them both off the loom and finish them. And, here they are: (They are each 11 inches tall). Now that the loom is finally empty, I warped up, using a ‘Four selvedges’ technique. I have begun a series of very very small tapestries that are 3 inches by 5 inches. I am making plaster frames for the series of 3 inch by 5 inch tapestries, and have started experimenting with how I will be painting them…. right now, the first one looks like a black blob, so there’s not much point in photographing it, but I will soon. I am working on some larger pieces, too. Must take some photos…. 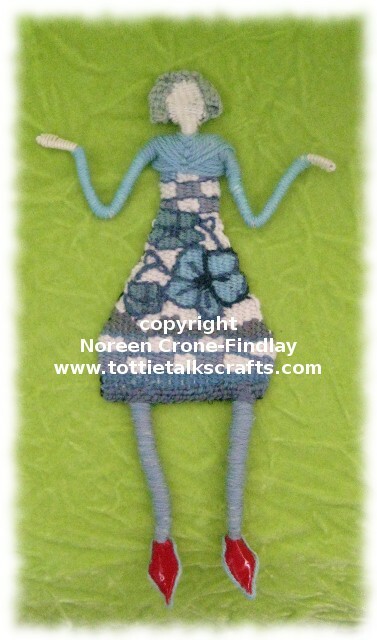 I’ve been working on a series of little woven ‘dancing ladies’ for my Woven Women show. 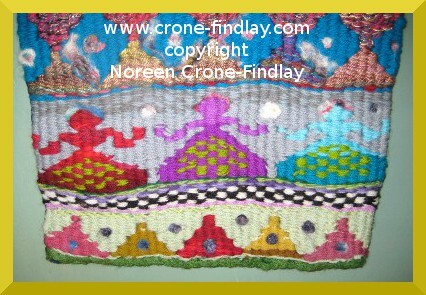 And, I am participating in a tapestry weave along on Ravelry. This week, I finished one of my Dancing Ladies- “Snowy Spring”. I have a thing about red shoes, so, I just had to make red patent leather shoes for her…. She’s about 13 inches tall/33 cm tall. I wove her on the Schacht Mini loom, which is a small plastic loom that I quite like. I was surprised by how well it worked for tapestry weaving- I wasn’t sure about tensioning on it, but that was not a problem. (I wove in a tiny thin dowel at the top, which worked beautifully as a shed stick, and provided some tension). I love how the tapestry diary is leading me in unexpected directions. In the deep mid-winter, I long for flowers. My studio is full of plants that bloom, and I am grateful for their beauty. She is 15 inches wide by 39 inches tall. 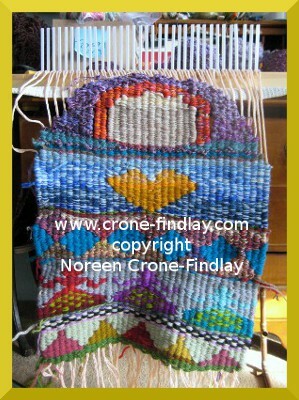 See: Woven Women-Dreaming the Well LINK for a photo of how I weave these tapestries on peg looms. My mother passed away recently, and one of the ways that I have been processing my grief is to take it to my looms and weave about it. Because I am deeply focused on weaving tapestries and woven pieces for my solo show, ‘Woven Women’, it was natural that this weaving would take the form of a Woven Woman. My mother suffered from a form of dementia, I have been feeling is how sweet it is for her to be released from that dreadful fog of confusion……..
One of my close friends gave me a seashell instead of a card, and it felt natural to have it become part of this piece. I made a Kumihimo cord and tied a Celtic everlasting knot, which is stitched to her forehead, but barely visible under her cowl. Weaving this tribute brought me great peace and comfort, and I think that my Mom would like it a lot. 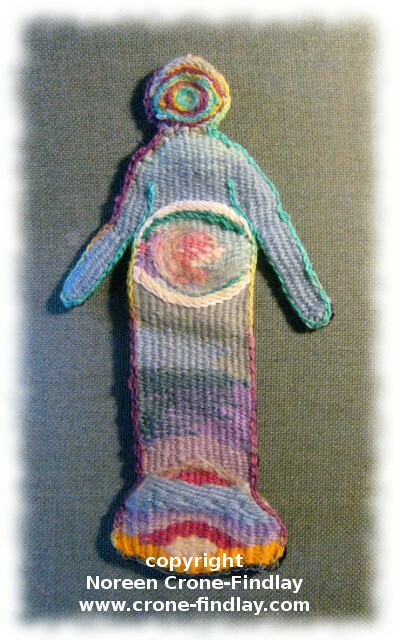 I am working on a series of woven piece, called, ‘Woven Women’. 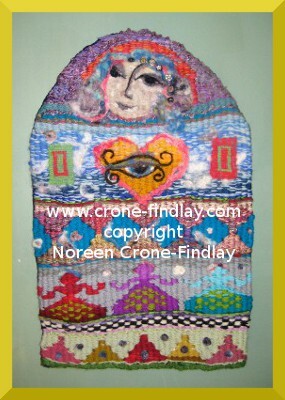 Here is my most recent Woven Woman, ‘Dreaming the Well’. I wove her on a peg loom. 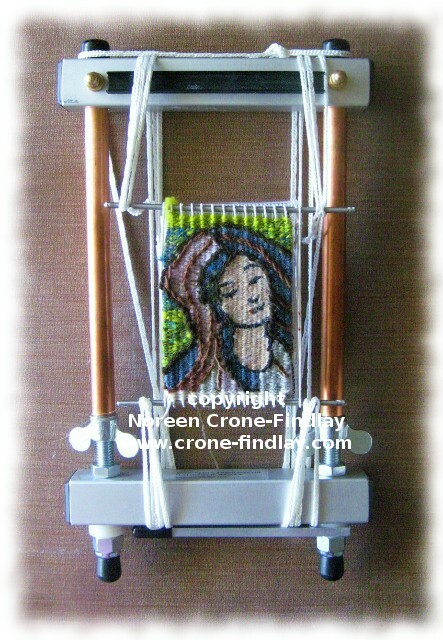 Here she is, with the weaving complete, still on the pegs of the loom. And here are some closer looks. She’s 27 inches tall by 17 inches wide (69 cm by 43 cm). Unfortunately, my camera messes with the colors and makes the edges harsher… the felting does soften things up very nicely. The images are based on meditations, dreams and just whatever wanted to be woven at that moment. I keep promising to show more of the Woven Women pieces, so I will post more pics of them throughout the next few days, so stay tuned! 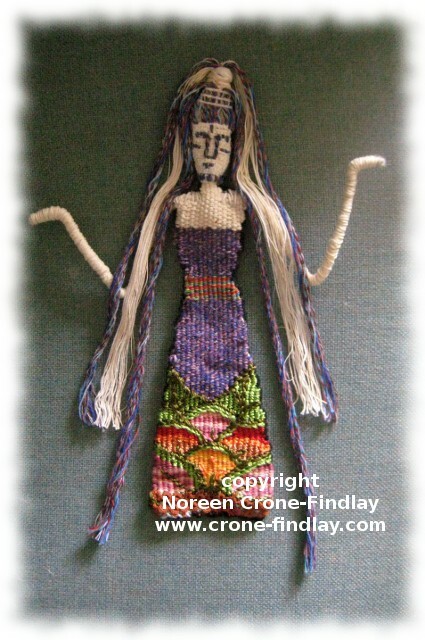 Over the last couple of years, I have been weaving a series of tapestries and one of a kind art dolls. I am calling this series, ‘Woven Women’. I made a little video mini tour of one corner of my studio, showing ‘The Green Empress’. 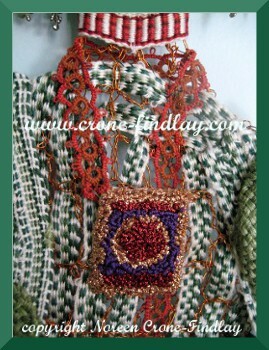 The Green Empress brings together many of my favorite fiber techniques: Tapestry weaving, inkle weaving, small loom weaving, crochet, wire work, tatting and punch needle embroidery. 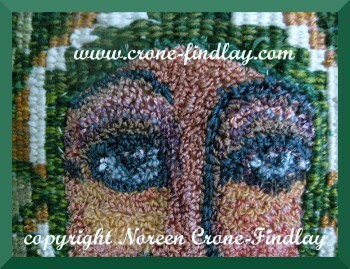 My plan is to eventually have enough ‘Woven Women’ for a one woman show. I don’t have enough of them finished yet, but I am working on it! 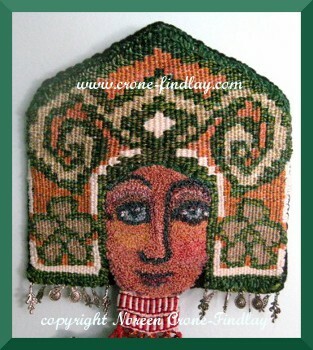 Her face is punch needle embroidery and her crown is tapestry weave. 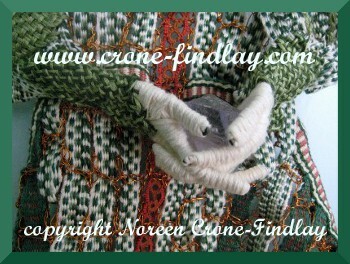 Her hands are heavy gauge wire, wrapped with cotton thread. They are cupped so they can hold small objects. 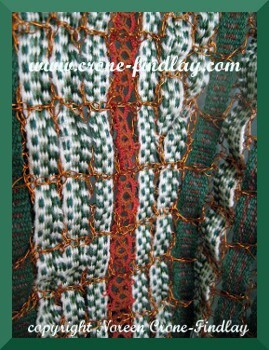 Her arms are inkle bands and 2 inch Weave it Squares, stitched and shaped and layered. Her feet are a combination of 2 inch squares that I wove on my vintage Weave it loom, with Inkle weaving. 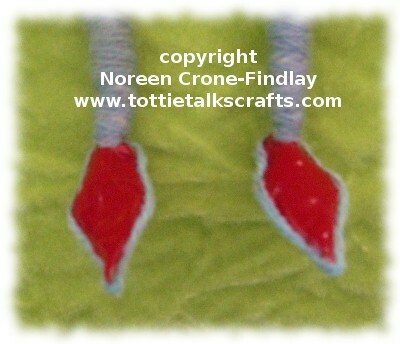 I just kept stitching and shaping until I was happy with her feet. 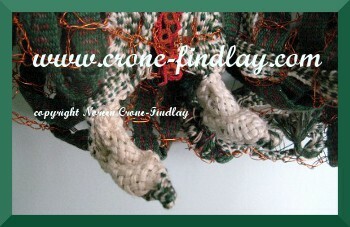 I crocheted wire in an open work mesh to shape her body and skirt. They, I wove miles of inkle bands (woven on my Schacht inkle loom) through them. I also wove in tatted lace, too. The skirt is about 24 inches wide, but is folded and stitched. 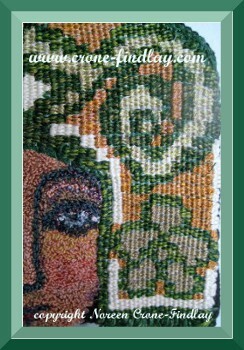 This closeup shows a small panel of punch needle embroidery , tatting, inkle weaving and the copper wire armature. Close up of one eye and part of the crown. You can see that I love Byzantine art, as there is a definite influence here.